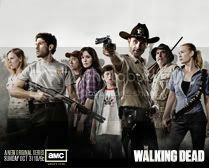 AMC is looking for a few more cast members for The Walking Dead and all you need to do to audition is watch the show. Play their Watch & Win game and you might win a walk-on role on the show. "... winning a walk-on role could be as easy as watching the premiere on Sun., Oct. 31 at 10PM | 9C. That night, as well as the five Sundays thereafter, AMC will reveal a secret code -- aired during one commercial break -- that viewers can then enter at amcdead.com for a chance to snag the coveted walk-on role. Six episodes. Six chances to win." So watch the show on Halloween (and the next five episodes as well), catch the secret code and then head over to AMCDead.com to enter for your chance to win.